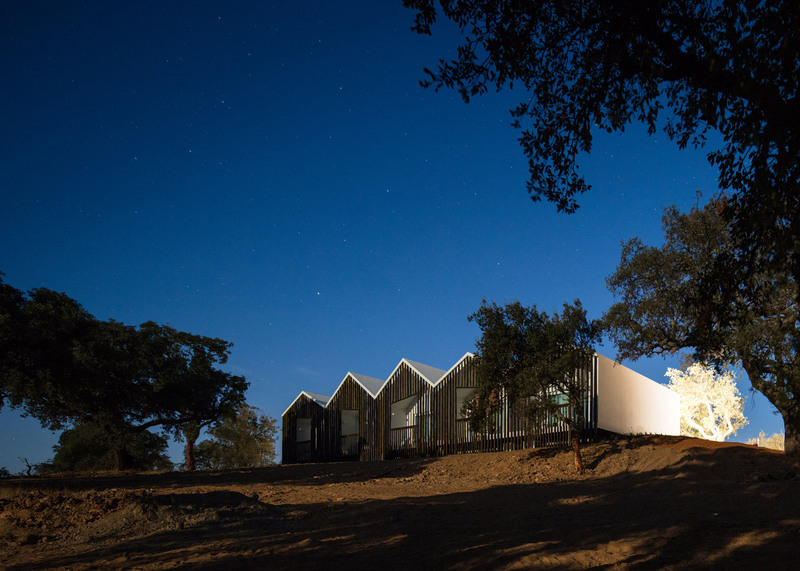 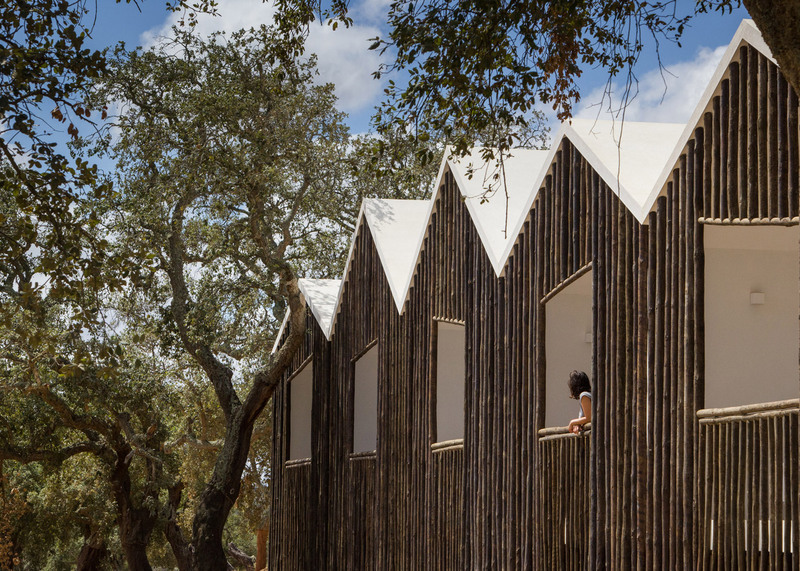 Vertical logs cover the gabled elevations of this rural hotel in southern Portugal, designed by Lisbon studio Future Architecture Thinking (+ slideshow). 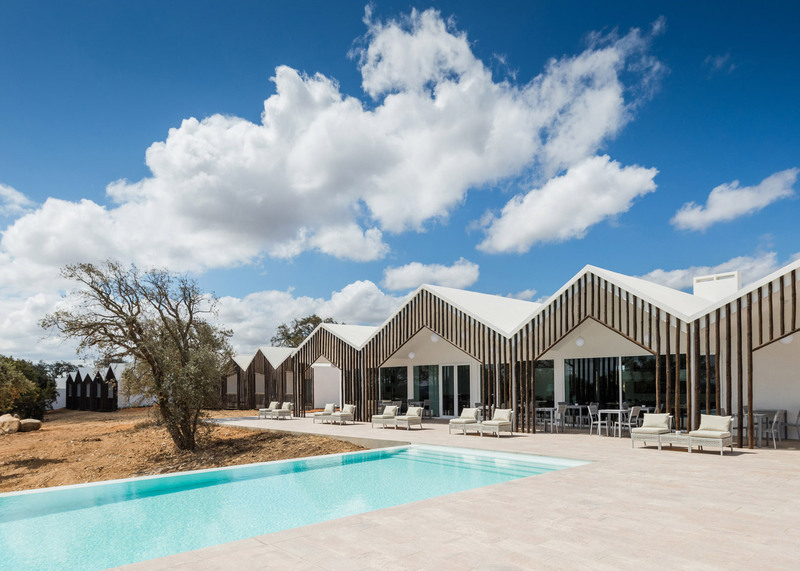 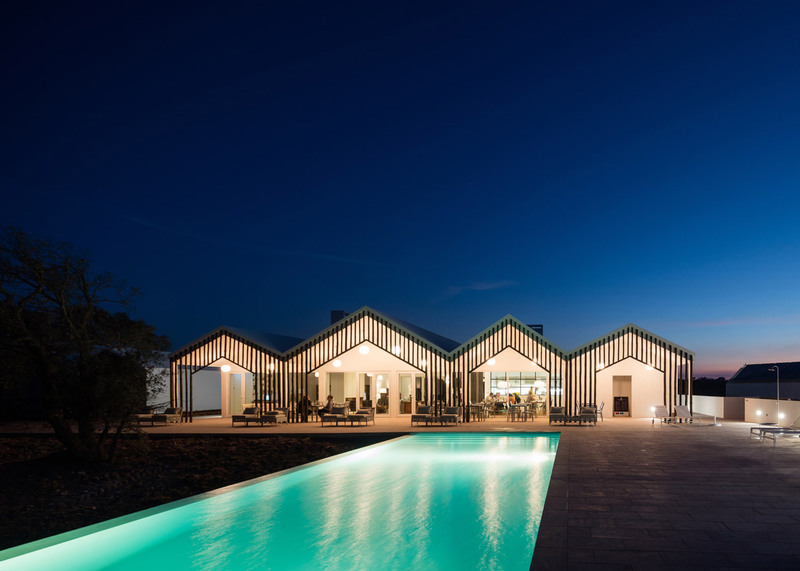 Miguel Correia's studio Future Architecture Thinking – whose past projects include an angular red arts and culture centre – designed the Sobreiras Alentejo Country Hotel for a site near the village of Grândola, about an hour's drive from Lisbon. 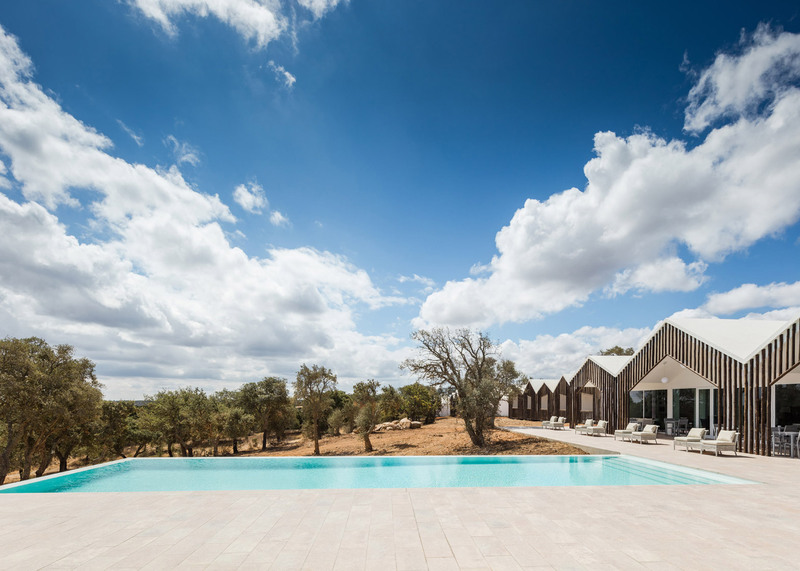 The 25-hectare estate boasts gentle hills, meadows and forests of cork oak trees. 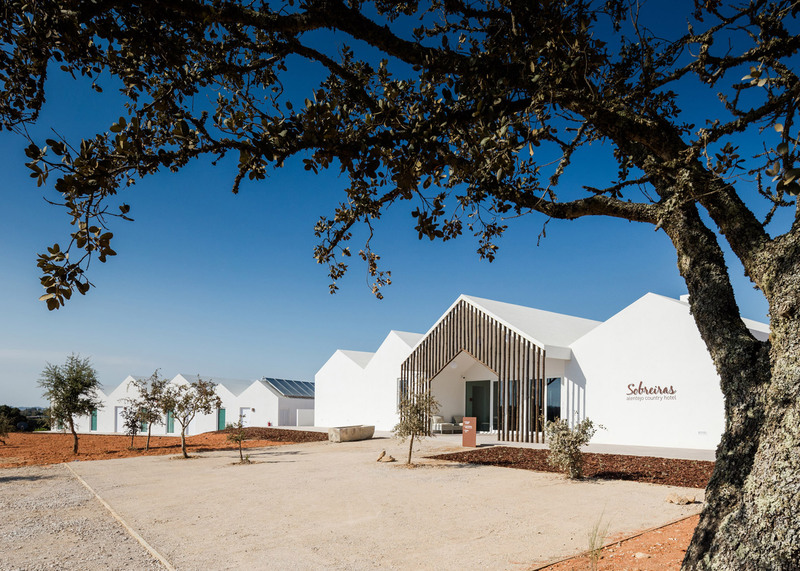 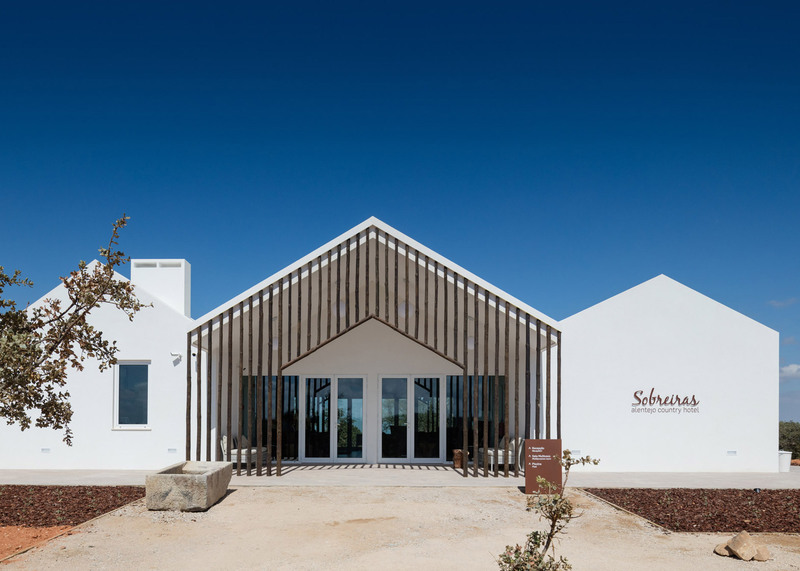 The project team set out to enhance the way visitors experience the landscape of the Serra de Grândola by retaining the natural characteristics of the site, and by complementing these with forms and materials familiar to the region. 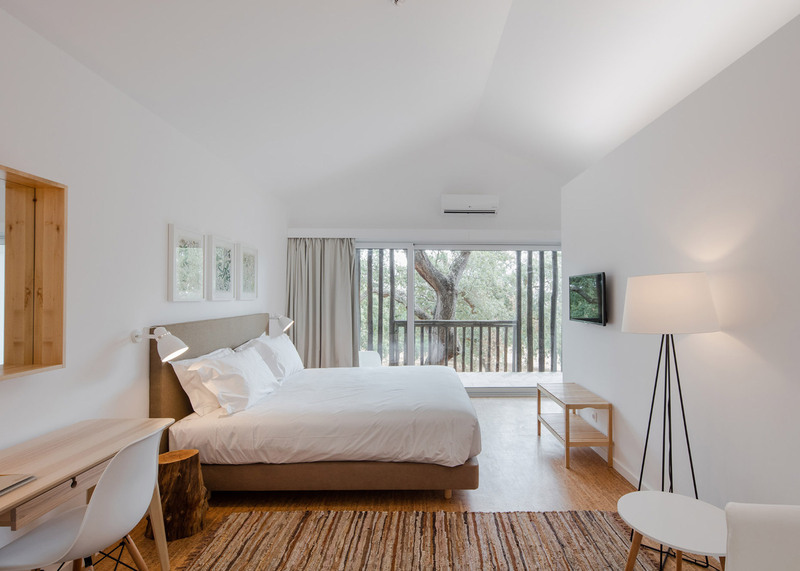 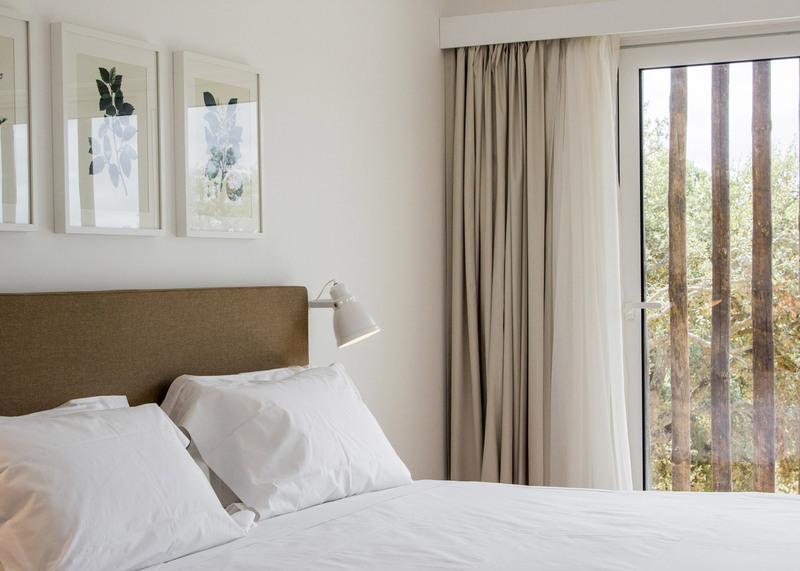 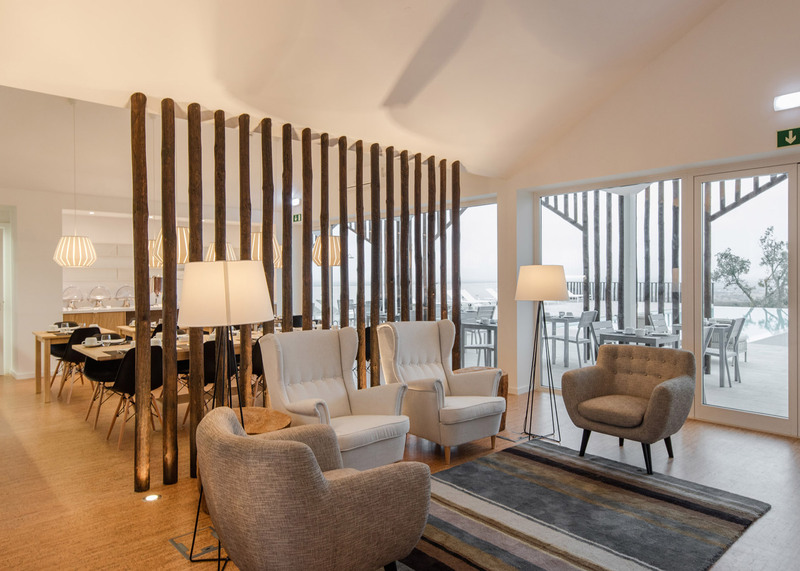 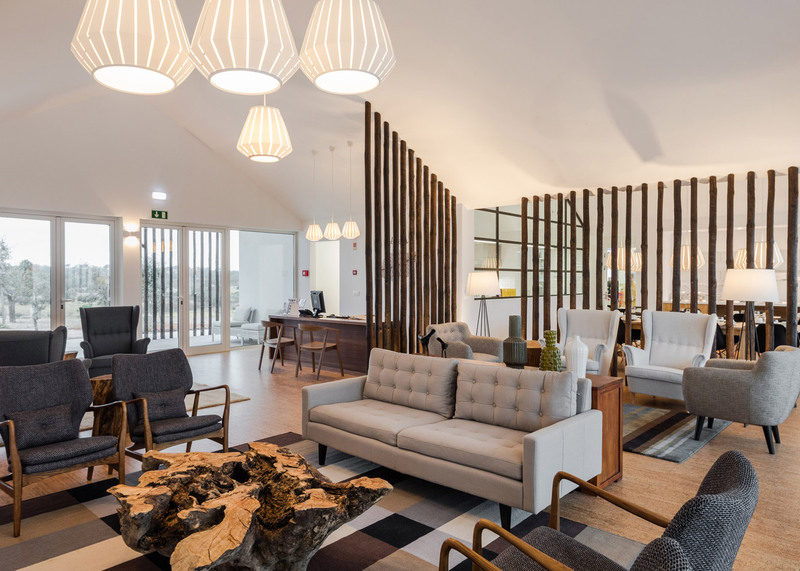 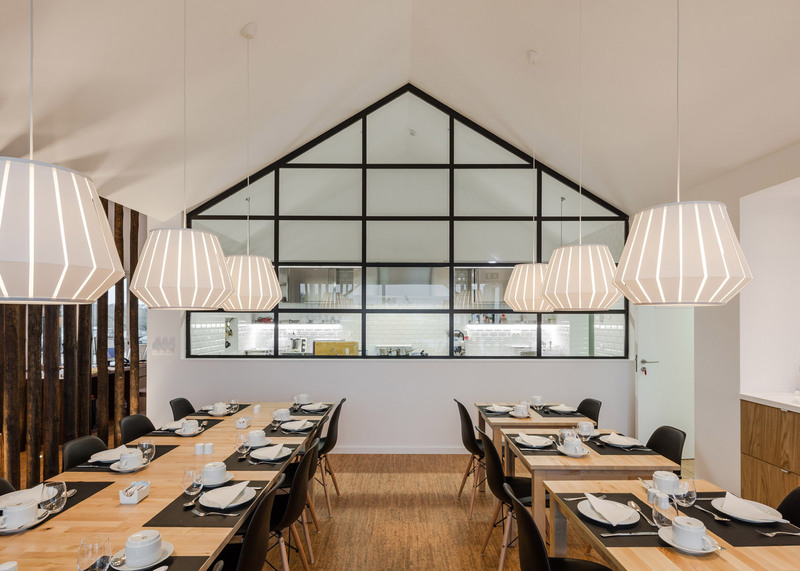 "The purpose was to value and favour the rural environment surrounding the hotel," said the design team, "taking it as a theme and seeking to provide a space to enjoy the countryside, full of comfort and quiet in a simple and contemporary atmosphere." 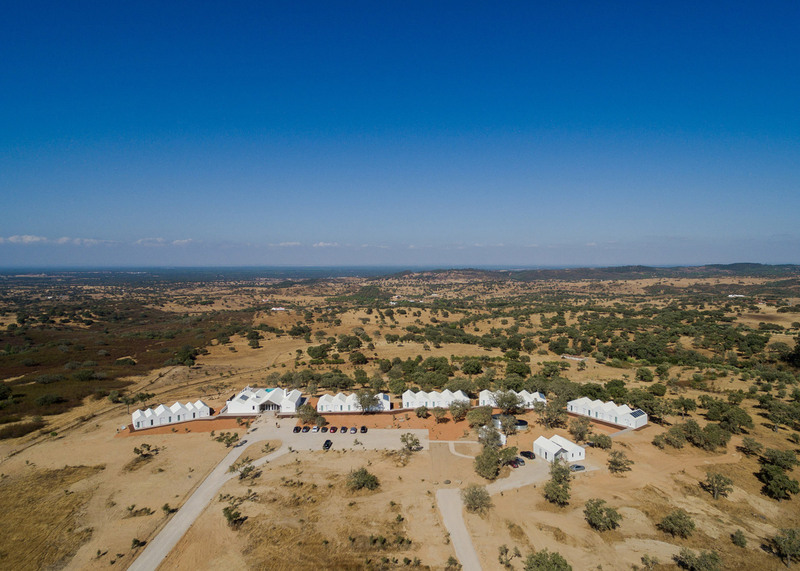 Positioned on the crest of a hill with panoramic views to the east, the hotel comprises eight buildings scattered among the existing trees. 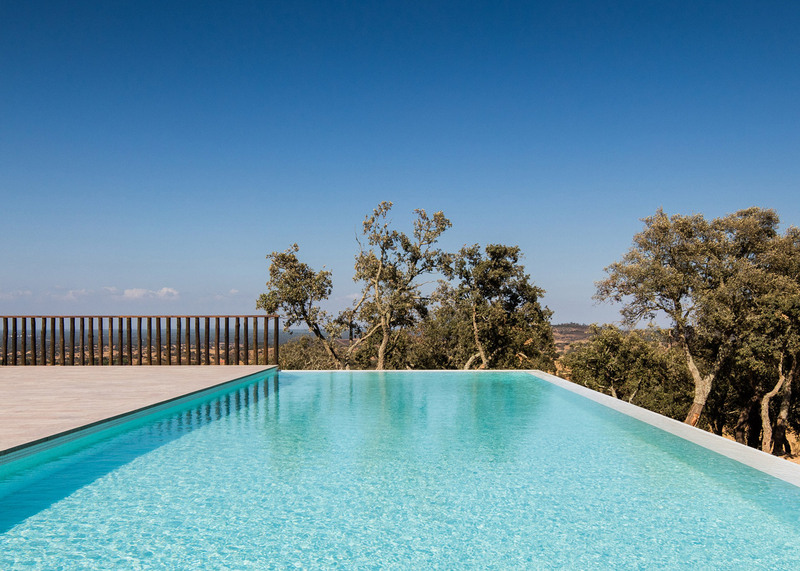 Rather than employing traditional foundations, the structures rest on piles that minimise soil sealing and permanent disruption to the land. 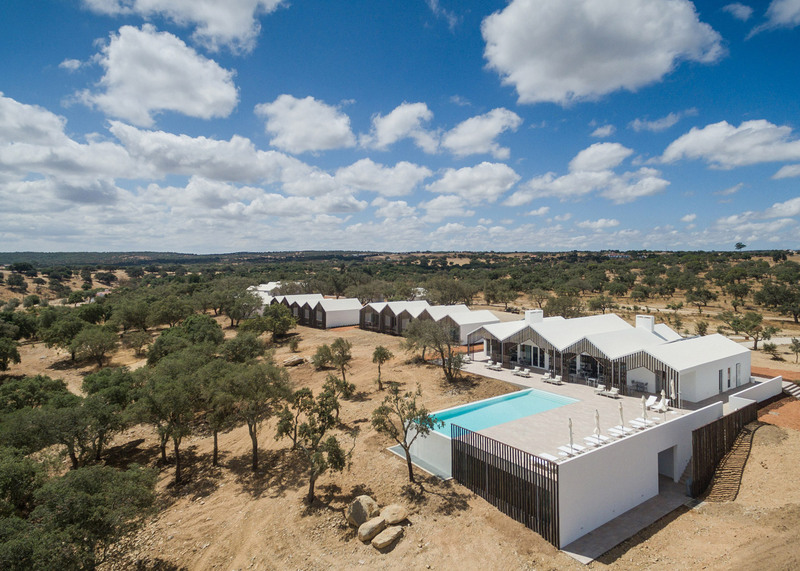 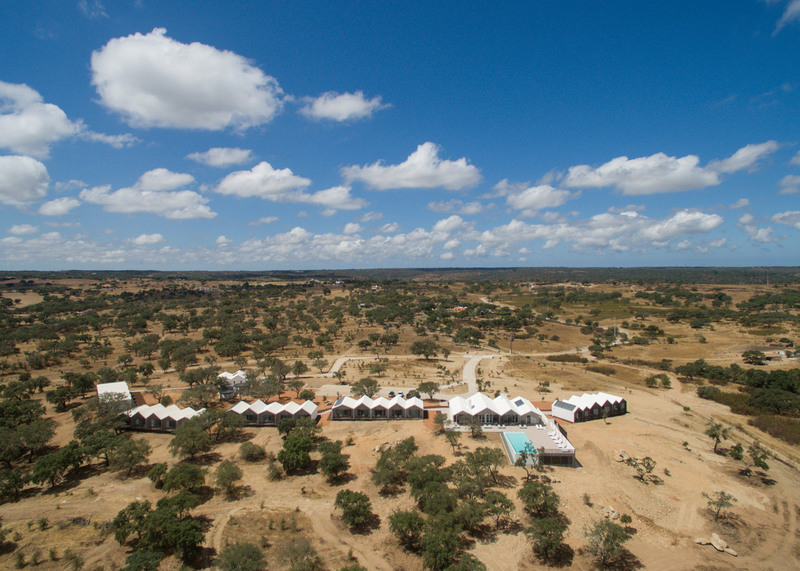 The largest of the buildings contains the reception, along with several lounge areas and a communal dining room, while some of the smaller structures accommodate services and staff facilities. 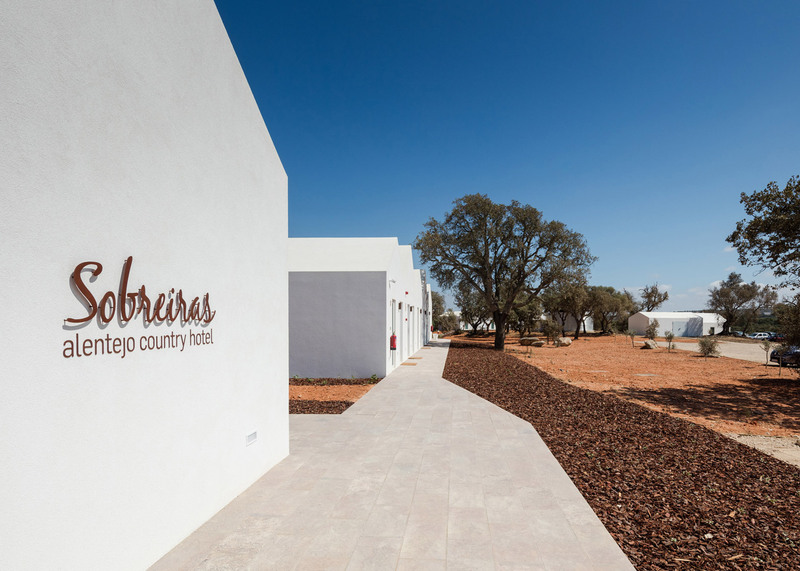 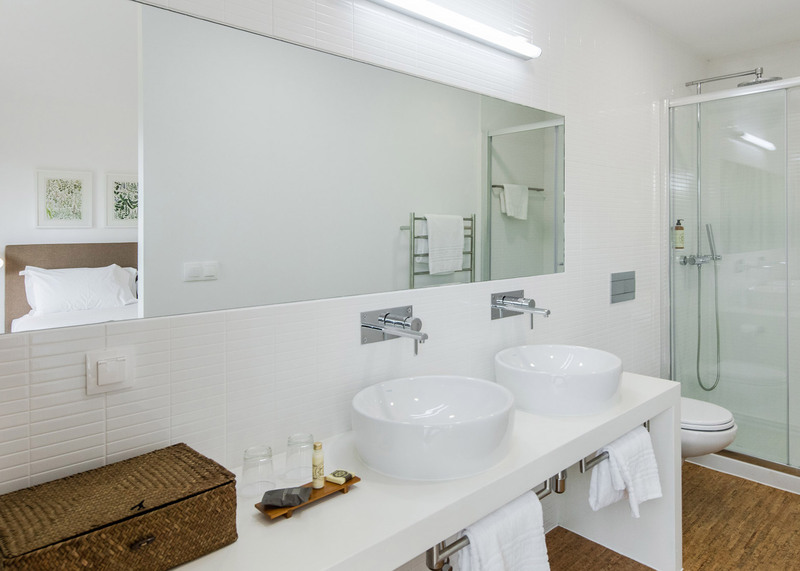 The hotel's 22 rooms and two suites are housed in the remaining five blocks, which each contain four or five units with individual balconies. 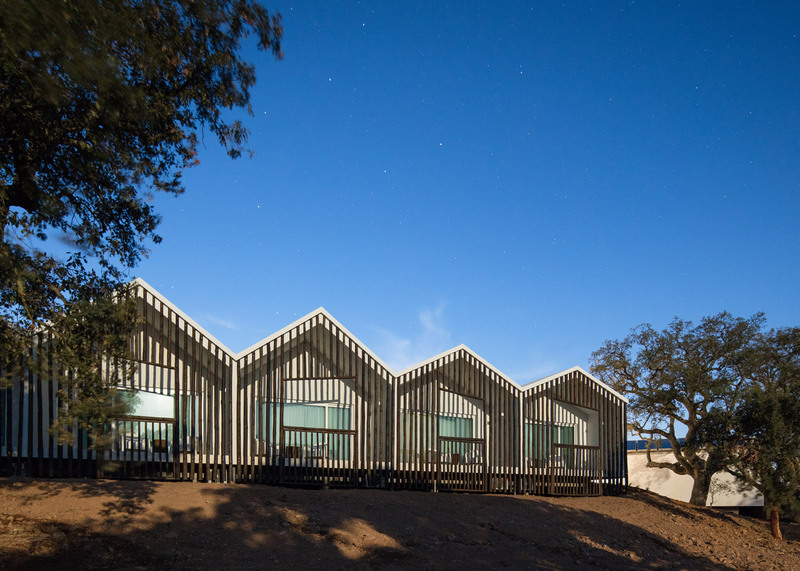 Each of the buildings features a row of gabled volumes, with stark white surfaces accentuating their minimal forms. 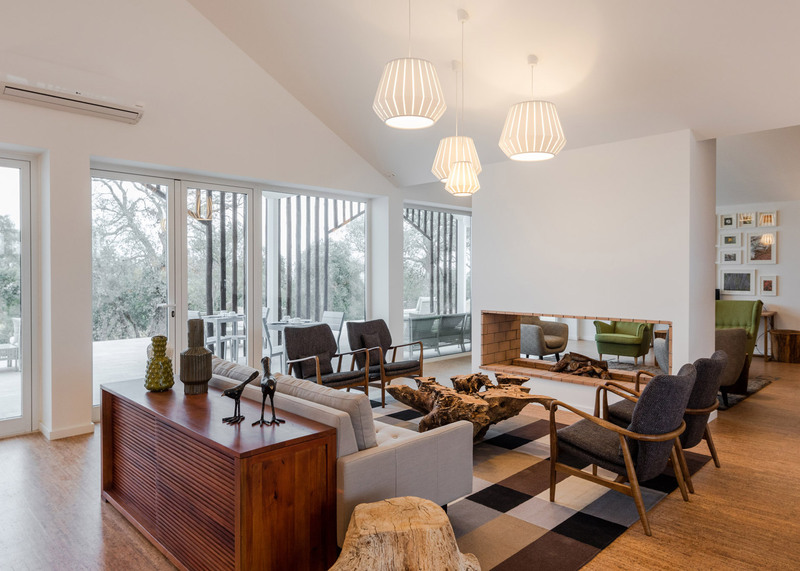 Wooden frameworks incorporated into the east-facing elevations introduce a rustic detail that echoes the nearby trees. 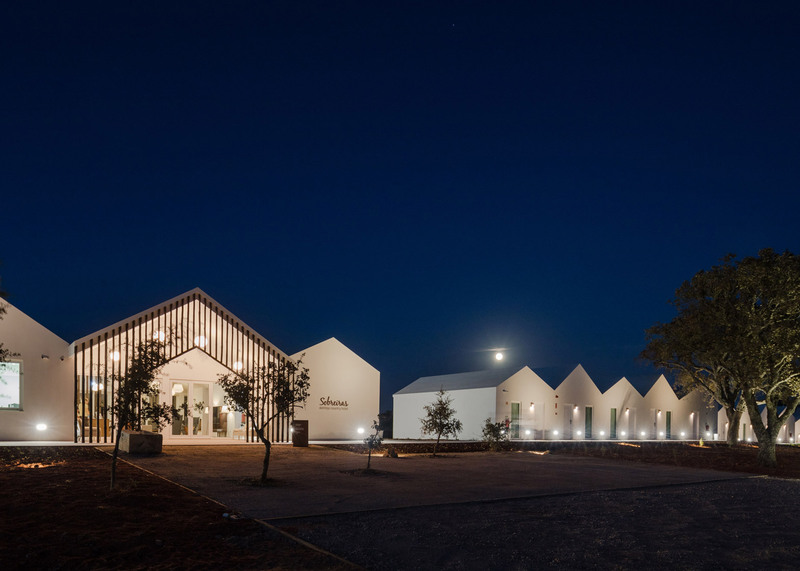 "The buildings, formally developed from the combined volumes of evoking the traditional image of a house, seek identification with the characteristics of the traditional regional architecture in the sobriety of lines and materials," the architects explained. 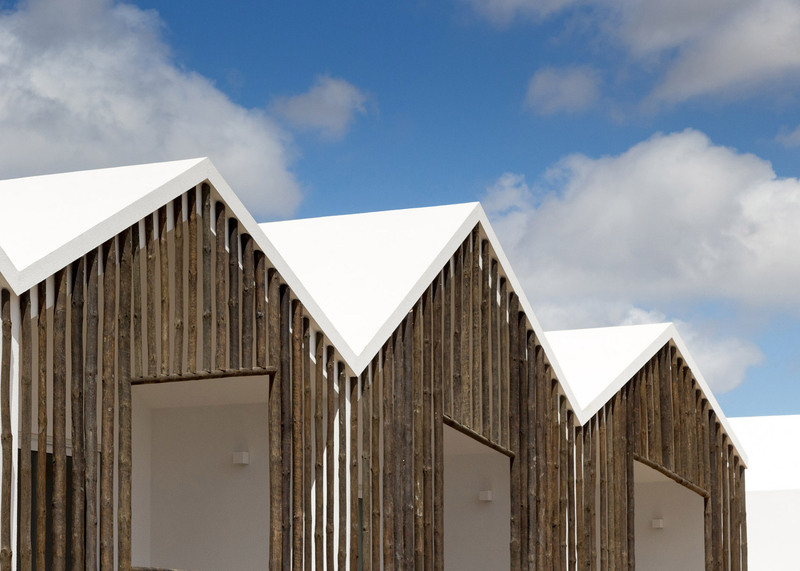 "Wooden logs used in facades establish a dialogue with the surrounding landscape, contrasting with these white buildings of simple and refined geometry." 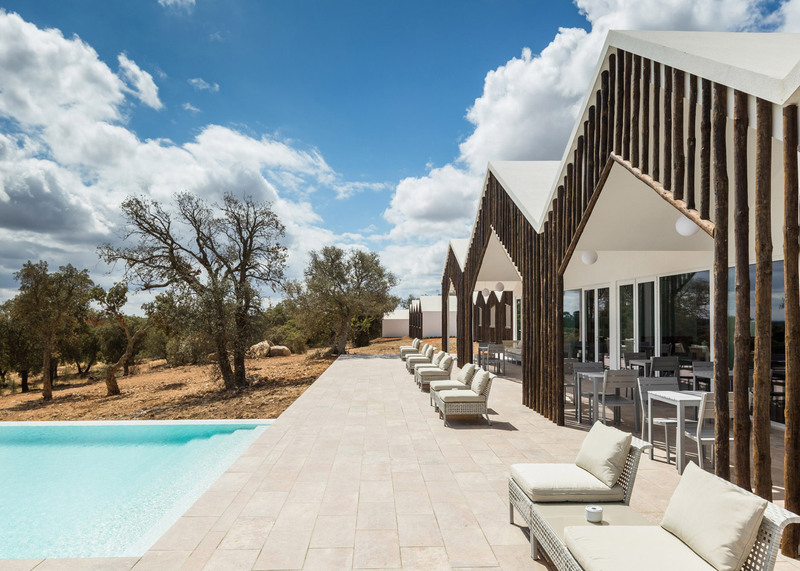 The log screens and extended overhanging roofs also help to shade the large glazed surfaces incorporated into these elevations, which make the most of the available views and natural light. 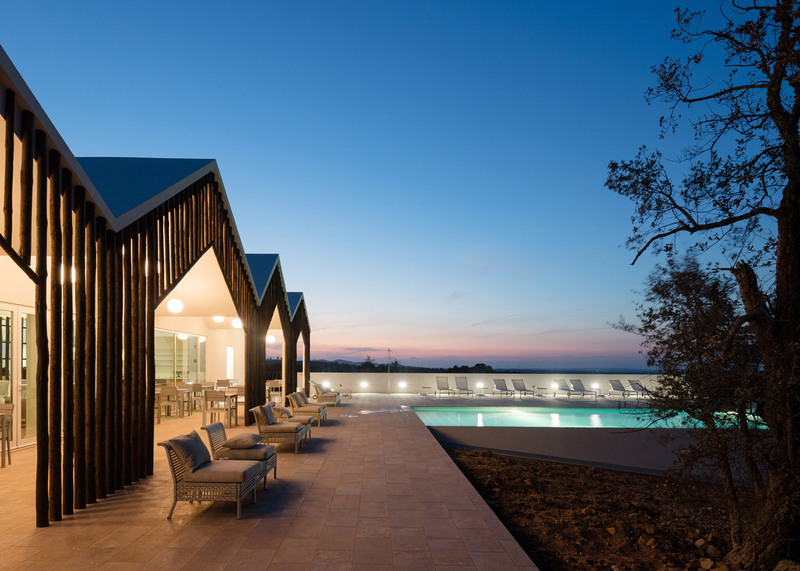 A similar surface of vertical wooden lengths distinguishes the entrance to the main building and the threshold between its rear facade and the adjacent poolside terrace. 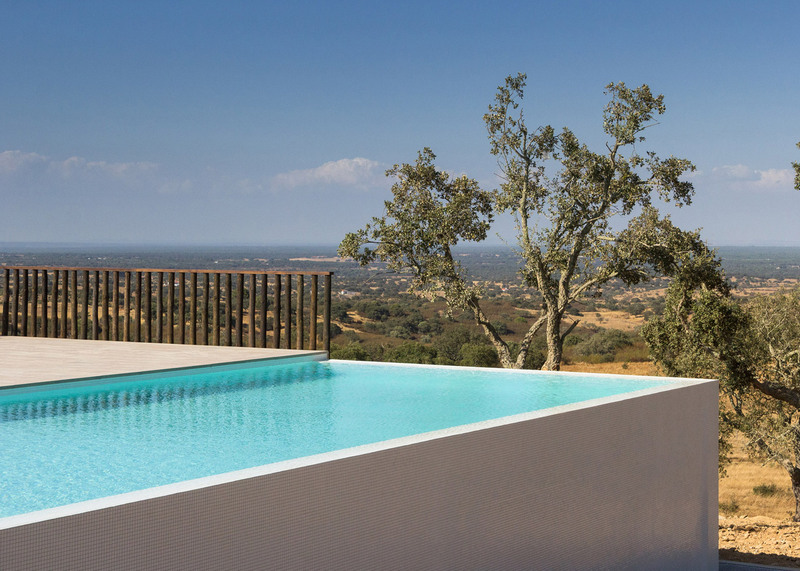 An infinity pool stretches out towards the horizon on the eastern side of the building, where landscaping is kept to a minimum to accentuate the hotel's proximity to nature. 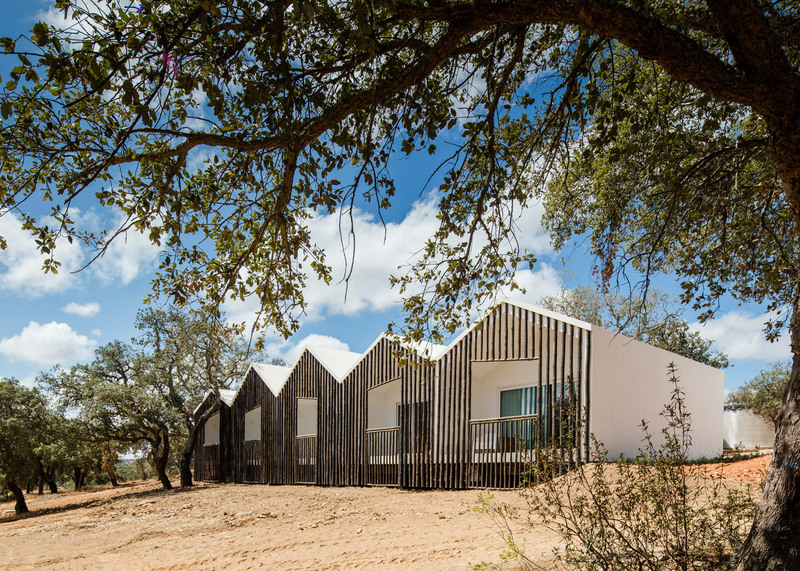 Photography is by João Morgado.